A new internal note reveals renewed efforts by a small group of member states to take Council transparency forward. The embattled EU is currently dealing with issues within, beyond, and on its borders all at the same time. Within its borders, the fresh conservative government of prime minister Cameron has made its first steps to arrange a ‘new deal’ for UK membership, while Hungarian first minister Orban insists that it can -and shall- continue a political debate about the death penalty. Outside of its borders, conflicts in a host of neighbouring countries, particularly Ukraine and Syria, are putting the EU’s security policy under pressure. And on the borders, tens of thousands of asylum seekers and other migrants are attempting the dangerous Mediterranean sea-crossing hoping to reach Italian -and thereby, European- soil. In this context, debate about the internal institutional politics of transparency hardly seems a priority. Yet such debate is exactly what is happening, and it might just mean progress too. On 17 April, when all eyes were on the Commission and its plan to further render lobbyists’ access to decision-makers visible by expanding its lobbying register, six Council members submitted a so-called ‘non paper’ in the junior preparatory Working Party on Information, entitled ‘Enhancing transparency in the EU’. For some time now, transparency in the Council context has been a difficult issue to discuss. The revision process of Regulation 1049/2001 has so far been a fiasco. Ever since the Danish presidency gave it a last shot (to no avail) during the first half of 2012 it has become, in the words of one official, a “toxic dossier”. Successive presidencies have therefore kept internal negotiations, as well as those with the transparency-eager Parliament, on the back-burner. The situation has led to a revision process that is now into its seventh year and a legislative act which for almost six years fails to comply with the Lisbon Treaty (although for the moment, the major issue has been addressed through informal arrangements). The Council majority and the Parliament appear as divided as ever, only perhaps now a bit more distracted than seven years ago. Because of this set of circumstances alone, Denmark, Estonia, the Netherlands, Slovenia and Sweden, the authors of the note, can be considered brave for giving it another try. The note they present is an example of low-profile politics (as well as regulation). It contains six practical proposals for areas in which the Council could take transparency forward. Most proposals are administrative in nature, and therefore should cause little offence among the EU-28. For example, initiatives to create an interinstitutional one-stop-shop IT portal for all matters related to the legislative process, as well as a register for delegated acts, would only streamline what was already agreed upon. Likewise, a proposal to create a better assessment framework for so-called limite documents (confidential but unclassified) cannot be blocked for much longer after the Court of Justice rendered an unequivocal judgment about the matter in 2013. Even a proposal to dust off a 2011 Commission proposal for a minimal revision of Regulation 1049/01, to bring it in line with the new Treaty situation, cannot be held off indefinitely because of the ungraceful legal situation that it puts the act in. The two remaining proposals, however, could spark off some protest among a majority of Council members. The first is about creating more transparent trilogues with the Parliament. The trilogues, which have been around for some years, have in most cases led to smoother and more efficient legislative relations with the EP. The Council has argued that this is due to a ‘space to think’ that the representatives of the EU’s two legislative branches enjoy in these meetings. While member states may sometimes complain about the powerful position that trilogues accord to the Council presidency, they will be reluctant to publicly disclose more details of ongoing interinstitutional negotiations. The second controversial proposal concerns initial steps towards a Council lobbying register akin to those of the Parliament and the Commission. The Council has long resisted outside calls for it to get its own house in order on this matter. Here, the question is what the scope of such a register should be. If the register is only to include lobbying within the Council Secretariat, that would entail little progress indeed. Acting as the facilitator of Council decision-making and with limited leeway, the Secretariat stakes its reputation on the apolitical and independent advice that it is able provide. Lobbyists are therefore far more likely to turn directly to the member states’ delegations to sell their ideas. It is, however, questionable whether member states would be willing to curb their sovereignty to the extent of committing to a compulsory register of all the meetings they have with lobbyists. Even if they would, surely such lobbyists could easily find their way to the responsible departments in the national capitals. At the same time, the Council is an empty forum without its member states. 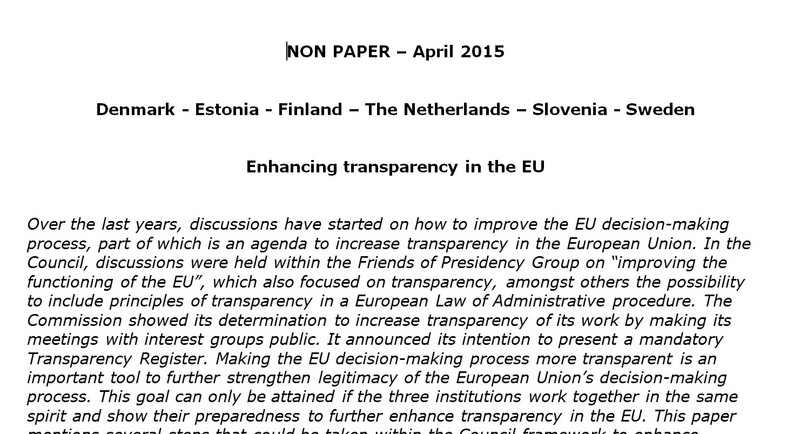 An alternative could therefore be to harmonize minimal standards of lobbying practices both at EU and national level. Whether member states would commit to such a plan however is even more questionable. Be as it may, the new note by the ‘transparency six’ and similar initiatives do succeed at keeping the debate alive. Finding common ground for new initiatives, even when they are small, keeps progress on transparency in motion. Thus, inch by inch, the Council continues to crawl towards greater transparency. This entry was posted on Monday, June 1st, 2015 at 9:55 am	and is filed under Legal reform, Practice. You can follow any responses to this entry through the RSS 2.0 feed. Responses are currently closed, but you can trackback from your own site.